It’s hard to ignore the signs of spring popping up around Seattle, from the sweet smell of Daphne ( daphne odora) to the colorful daffodils. 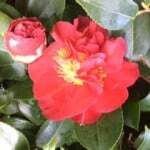 Camellias bloomed as usual in January but the warm ( for this time of year) and sunny weather has tricked other shrubs, trees and flowers into thinking it’s spring even the birds have been fooled as I listened to a sweet song earlier in the month. Cherry and plum trees are blooming about 6 weeks earlier than usual and they are beautiful with their lovely dark and light pink blossoms. Some of the best spots in the city to see such beauty are: The quad at the University of Washington, the Kubota Gardens, Washington Park Arboretum and the Japanese Gardens but even just walking or driving around Seattle you will be able to enjoy the blooms.